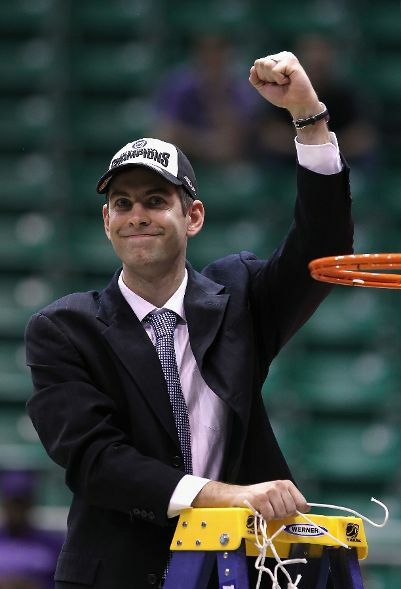 "There's 15-Year old Brad Stevens, in his 3rd season coaching the Butler Bulldogs"
Actually Brad Stevens is 33, though he looks much younger and acts much older. And while comparisons continue to be drawn from Hoosiers, in which the fictional championship game was played in Butler's actual home gym - Hinkle Field House, the Bulldogs don't play or act like underdogs. So you think Brad Stevens is destined for bigger things, a greater spotlight, truckloads of cash? Because Stevens is a Hoosier, if not an IU one. He grew up in Indiana (Zionsville), eating, drinking, and sleeping basketball. He went to Division III DePauw (Greencastle) to play point guard and earn Academic All-America honors. Then he got an assistant job at Butler (Indy) before moving up to head coach. Maybe the Indiana or the Purdue job would be bigger than the one he's got, but neither of those jobs are open. You'd have to think Stevens is staying put. He was once asked if he would leave Butler. He said, "I guess if they kicked me out." And Stevens has seen how the big jobs have eaten up his predecessors. His Athletic Director, Barry Collier, had a great run at Butler before spending several mediocre seasons at Nebraska. Then Collier left Nebraska to return to Butler in a administrative position. Stevens' mentor, Todd Licklighter also achieved great success at Butler, then swooned in three seasons at Iowa. Collier took a chance on the baby-faced head coach three years ago, and obviously made the right call. Doing things "The Butler Way" now has Stevens and his squad one step away from immortality against perennial powerhouse Duke. How will it all end? Don't jump to any conclusions. Not with this program.